Will your dual-fuel gas turbine (GT) start on distillate the next time you hit the button? Will your engine transfer to oil from gas without tripping offline the next time you switch fuels? Ineffective procedures for assur­ing high availability of the liquid-fuel system. Diligent maintenance and regular “exercise” of all sys­tem components are particularly important. Inadequate training of O&M per­sonnel. Liquid-fuel systems can­not be an afterthought; they com­mand respect. Off-spec fuel, either through pur­chase or deterioration in storage. Coking of oil in piping and valves located close to hot engine parts. 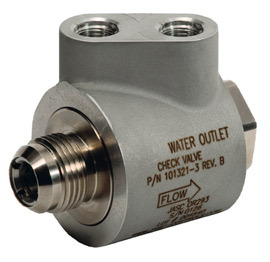 Check valves do not reseat prop­erly. The first three items are well within the plant’s control. A solid dose of commitment is all that’s needed in most cases. The last two also are within the plant’s control—at least for facilities equipped with dual-fuel GE Frame 6, 7, and 9 DLN engines (including F class)—but they require a small investment either in new hardware or modification of existing equipment. You may recall that the first liq­uid-fuel systems for dual-fuel DLN engines had separate valves for fuel and purge air. Also, that purge air is supplied continuously when the turbine is operating on gas; it is turned off when operat­ing on oil. Liquid-fuel check valves are prone to coking because of their close prox­imity to the engines served. Simply put, the light frac­tions in the small amount of oil that remains in the valve when the unit trans­fers to gas distills off, leav­ing a carbonaceous residue which could impede valve operation on ensuing starts and fuel transfers. Residue accumulates with each start and fuel transfer, often pre­venting proper seating of the check valve when oil firing ends. When this occurs, purge air and combustion gases can travel all the way back through the oil piping to the flow divider, and beyond, causing fuel system evacuation, corrosion of the flow divider, and other issues. Units experiencing this condition are prone to tripping on the next attempt (1) to start on liquid fuel or (2) to transfer from gas to liquid fuel (no fuel in the line connecting the flow divider to the check valve). One of the steps undertaken by the OEM to improve the reliabil­ity of its dual-fuel DLN frames was to combine the functions of the liquid-fuel and purge-air check valves into one valve body. 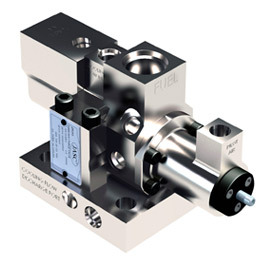 Today, the three-way purge valve (3WPV) is standard equip­ment on DLN-equipped Frame 6, 7, and 9 engines (Fig 2). 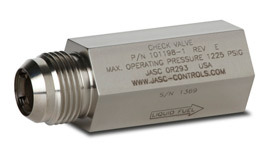 About 5000 of the valves, made by Jansen’s Aircraft Systems Controls Inc (JASC), Tempe, Ariz, are installed worldwide. Scores of GTs still are equipped with individual liquid-fuel and purge-air valves and most would ben­efit from conversion to the 3WPV. However, there’s no stampede, according to Schuyler McElrath, because problems associated with distillate firing have caused many engine owner/operators to just give up on oil. Even the 3WPV is subject to coking problems. By way of background, McElrath spent nearly 25 years working on fuel systems for the OEM before starting his own company, SMTC Inc, Green­ville, SC. He spends much of his time helping users solve liquid-fuel prob­lems on behalf of JASC. 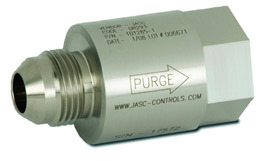 Recognizing the paralyzing effect coking was having on GTs, JASC President Harvey Jansen, a pioneer in high-tech fluid-flow solu­tions for the aerospace industry, went “all-in” on the company’s ability to develop a “cool” liquid-fuel check valve. Nearly four years ago, following successful beta tests at a refinery, the company began offering a water-cooled version of the liquid-fuel check valve (WCLFCV). These GE-approved valves now are installed on more than 100 engines worldwide. McEl­rath reports virtual 100% reliability on starts and fuel transfers. The next logical step was to devel­op a water-cooled three-way purge valve (WC3WPV), shown integrated into the liquid-fuel system in Fig 3. A WC3WPV was required because GT owners using this technology needed an inexpensive way to achieve liquid fuel system reliability. Piece of cake considering the company’s proven success with the WCLFCV. But Jansen, who epotimiz­es the iconic American technology/business leaders Thomas A Edison and Edwin Land (Polaroid), was con­cerned more about cost than simply designing a water-cooled valve.